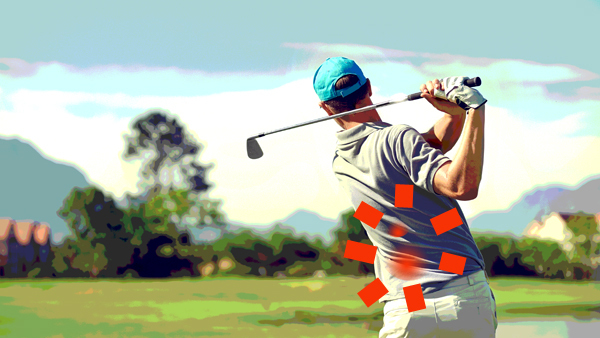 One of the most common injuries that golfers deal with is low back pain. The rotational aspect of the golf swing as well as the increased time spent in a flexed posture can put tremendous strain on both the spine and the surrounding muscles. Not to mention that a typical round of golf can last up to 5 hours and consist of over 100 swings, including practice shots. When combining the bent over posture and rotational demands of a round of golf with that kind of exposure, golfers tend to be at an increased risk for low back pain. Stand with a cord, or cable, at your side. Pull the handle to the center of your chest (near the bottom of your sternum), press outward, pause, bring the handle back to your chest, and return to the starting position. Be careful to keep a tight core and your trunk still throughout the movement. With an elastic band or loop around your ankles, step laterally approximately 10 feet to the left and then back to the right facing the same direction. Begin by taking a large step with your lead leg keeping your toes pointed forward. Follow with your trail leg taking a smaller step as to keep constant tension on the band/loop. These exercises not only strengthen your core and hips but also help you develop better movement patterns. Smoother, more efficient movements help not only to decrease your risk of injury but can also improve your performance! If you continue to experience pain while playing golf, set an appointment to come in and see one of our expertly trained Physical Therapists like Victoria Zaunbrecher, PT, DPT, OCS whom we interviewed for this post. Dr. Zaunbrecher is a Board Certified Specialist in Orthopedic Rehabilitation, practices various treatment techniques including Manual Therapy and Dry Needling, and is an avid golfer. Not sure if you need physical therapy? You can always schedule a free screen where we will take a look at you and assess your need for PT for free!